Margi Weir, an Associate Professor of Painting and Drawing at Wayne State University, calls upon figurative arrangements seen in Egyptian tombs and Grecian amphorae and presents them in a tapestry-like fashion; the juxtaposition of elements creates unique pleasing patterns, blurring—but not hiding—the socio-political and ecological themes in her pieces. Margi Weir earned her MFA in painting from the University of California at Los Angeles (UCLA); her MA in painting from New Mexico State University; her BFA in painting from San Francisco Art Institute; and her BA in art history from Wheaton College, Massachusetts. 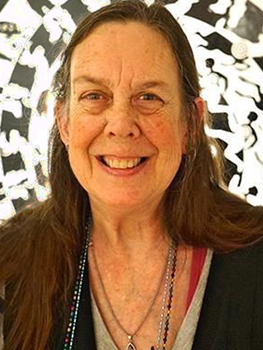 Weir has won numerous awards for her work, including a 2016 Best of Show award at the Las Vegas Contemporary Art Center and a 2015 Best of Show award in the Human Rights Exhibition, South Texas College, McAllen, TX; a 2015 First Place award in the Armstrong Annual 2-D Competition, Armstrong Atlantic University, Savannah, GA; and a 2015 First Place award in the Crossover and Composites: Hybrid Forms, Techniques and Media, The A.D. Gallery, University of North Carolina, Pembroke, NC. In addition, she has had many solo exhibitions, notably at Ivan Karp's OK Harris Gallery in New York and the Ruth Bachofner Gallery in Santa Monica, CA. She has completed installation pieces at Athens Institute of Contemporary Art (ATHICA), Jonathan Ferrara Gallery (New Orleans LA), Central Features Gallery (Albuquerque NM), Lexington Art League (Lexington KY), the Elaine Jacob Gallery (Detroit, MI) and the Las Cruces Museum of Art (Las Cruces, NM).